Ever notice how squirrels stash away nuts in the fall in underground emergency stockpiles? Yeah, I get that sentiment. Every spring. 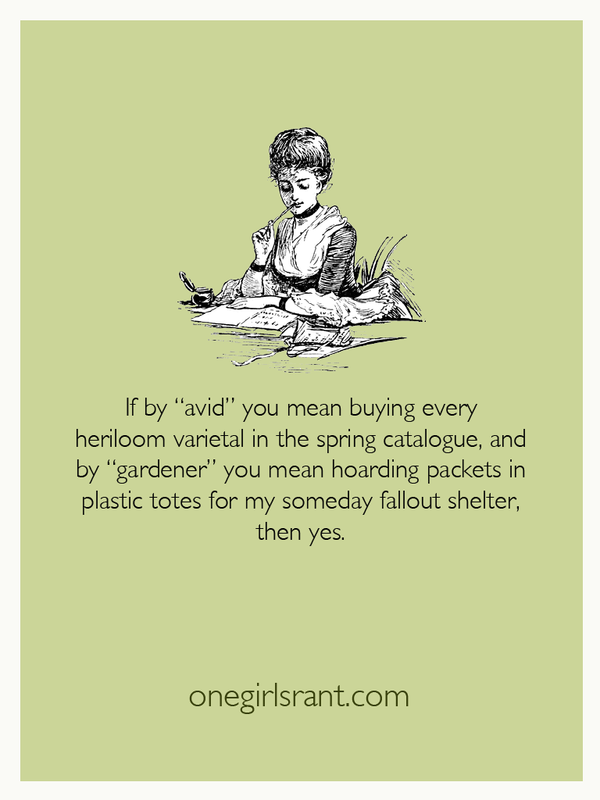 I morph into an avid gardner right around the first of February when snow-fatigue sets in. Which is why my seed mail orders are arriving this week. Each delivery is like a little party to celebrate spring. A surprise party, as I can never remember exactly what I ordered weeks ago. I’m super into heirloom varieties, apparently. Tomatoes in particular – it appears I love me some tomato seeds. I oggle over each packet then place it in the box with my other seeds. The ones I got in the mail last year. As well as the year before. Plus the year before that. I have the spirit of a farmer except farmer’s seeds actually make it into the ground. This is not a problem as far as I’m concerned. In a zombie apocalypse I got this thing covered. Last year my husband went crazy with Hydroponics and his tub of plants ended up in MY SPA BATHTUB..needless to say I moved the surviving lettuce and Chard to the large garden pots in the yard as most of his 3 tries at different seeds and plants died! I love my seed packets! Every year I say I’m not buying any more seeds but every year I buy more than the last. Some people like shoes. I like seeds! LOL Only have 3 pairs of shoes. Love your blog and posted your youtube video on the hazards of backyard chickens on my own blog – furfeathersntales.com …I like heirloom tomatoes too. I have six sorry-looking stick-like stems in the dirt with a leaf or two on each. If they actually yield a tomato, that would be amazing. Upper Midwest here and the tomatoes and basil look horrendous.